Use this interactive widget to see a step-by-step explanation of long division. This is a randomly generated long-division sum. See similar widgets on long addition, long subtraction, and long multiplication. Long division is a method for dividing numbers. Long division is used for dividing numbers that have many digits. Doing long division is easy. 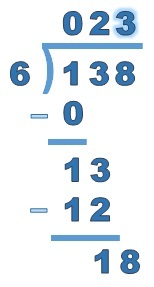 Identify the number being divided (called the dividend) and the number you are dividing by (called the divisor). Divide the first digit of the dividend (1) by the divisor (6). Do not count remainders. 6 goes into 1 0 times. Write the answer (0) above the long division bracket. Multiply the answer from Step 3 (0) with the divisor (6). Subtract the bottom number (0) from the top number (1). Bring down the next digit of the dividend (3). Divide this number (13) by the divisor (6). Do not count remainders. 6 goes into 13 2 times. Write the answer (2) above the long division bracket. Multiply the answer from Step 8 (2) with the divisor (6). 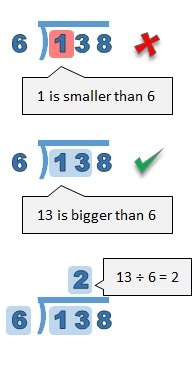 Subtract the bottom number (12) from the top number (13). Bring down the next digit of the dividend (8). Divide this number (18) by the divisor (6). Do not count remainders. 6 goes into 18 3 times. Write the answer (3) above the long division bracket. Multiply the answer from Step 13 (3) with the divisor (6). 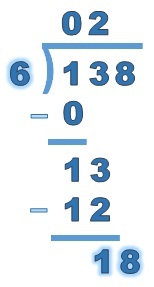 Subtract the bottom number (18) from the top number (18). There are no more digits to bring down. The solution to 138 ÷ 6 is 23. The slider below shows another real example of how to do long division. The number you divide into is the dividend. When you gain enough confidence, you will notice that the first few steps in this lesson are not necessary. In Step 3 of the example, 1 is divided by 6, and so won't divide at least once. That is why 0 was written above. Instead, don't divide by the first digit of the dividend, but move along the digits, left to right, until you find the first number larger than the divisor. Just remember that the answer must be written above the last digit. The 2 must be written above the 3 in 13, not the 1.